My friend Patrick once said to me…“Celia, you’ll sleep when you’re dead”. He was referring tongue-in-cheek to how crazy busy our lives get sometimes. And indeed, the first half of this year was both hectic and stressful. This is how we eat when we’re feeling lazy – almost all the ingredients are in the freezer, and I can assemble the burritos in under an hour. I defrost tortillas, pulled pork, grated cheese and leftover rice, then cook a quick batch of frijoles refritos. The tortillas are filled, seasoned with a little chipotle salsa, then topped with cheese and baked to golden. All in all, we’re pretty chilled out at the moment, and it’s glorious. How are things going in your part of the world? Sounds delicious Celia. Pretty chilled here too, in more ways than one! It’s bloody freezing here, and this broken foot has forced me to be housebound and mainly seated… which is good and bad, as you can imagine. I love that you cracked such a beautiful bottle of wine to enjoy with your family. Hope the gloriousness continues love. Oh…the garlicky lard… the only question I have to answer is, should I make the journey when I’m in Sydney in a few weeks time and transport back across the border? You call that slowing down??? although I can relate to that very old bottle of red wine and light games on the computer. Both these things help me to ‘turn off’. Every dish in this post makes me want to have a mouthful, including the tea and wine. How wise you are to slow down for a while, I hope you reap much benefit. Thanks for still posting through your slow down. Lovely post! Today I’m at half speed too. It’s been raining, so I have been doing things in the house. They’ve been piling up waiting for a day like this! It’s been so dry and hot that the rain was appreciated. Pretty slow here too, Celia. Mostly just because I’ve got a boring head cold. Lots of cups of tea, though. Oh those Curry puffs looks delicious, since I am vegetarian, I am going to make them with potatoes, spinach and herbs. Wish me good luck. And thank you for sharing! I often ponder about the day that I can share a bottle of something nice with my girl. Just over 10 years to go. Im not wishing my life away, but its something I am looking forward to. DO enjoy doing what pleases you at YOUR half-speed! I am trying to go in the opposite direction after a difficult first six months with reams of notes of all I want to achieve in the ‘real world’ in the second half :) ! Sounds like bliss to me. I’m curious about using the starter as a thickening agent! Tandy, it’s so interesting! Adds a slightly sour note to the dish as well! That’s a good effort at slowing down. You can’t just stop, and still want to eat well, so a happy balance. Plus in the cooler weather good food is a welcome source of distraction. So my question is, how was the wine? 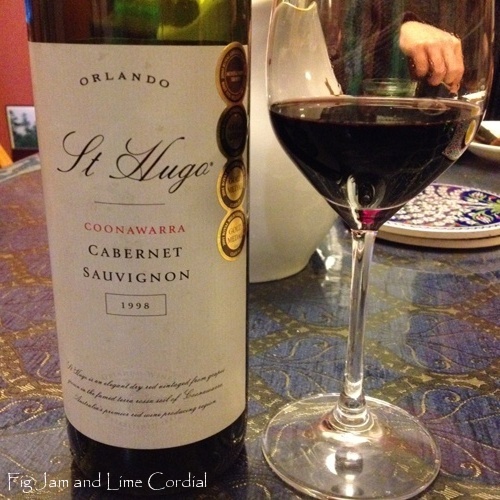 St Hugo is a fine drop with plenty of bottle age, but, being under cork, there is always risk…. I’m most interested in learning about using a starter for thickening. Nifty idea. Misky, it’s really interesting! And as you said, nice to be able to do something with the starter we normally discard! Enjoy your down time. You won’t have your boys forever so soak up every minute you can. The wine drinking made me smile. :) The curry puffs made me hungry. Maureen, I’m so aware of that! I think I’ve been aware of it since they were little – they seem to have grown up in a heartbeat! I think that’s a good idea… I’m already slowing down, Celia. I’m not even 24 yet! Kari, I think we don’t realise how much stress takes out of us. Slowing down can be hard sometimes though! Thank you! I’ve just reached the UK and NEED to chill – I’ve not felt this exhausted for a long time. Would love some slow pottering time in the kitchen – hopefully when my little sister arrives I’ll get to do this. Lovely post Celia – and yes understand your pleasure in sharing that bottle of wine. Nice idea to slow down!! I´ll try as soon as winter holidays begin. Hopefully I´ll really get to do it when visiting my eldest daughter , who is living abroad…. (soon…in August). Lovely post Celia, I´ll love to meet you if someday I travel to Australia!!!!!!!!! It is always a good idea to slow down now and then! Enjoy the slower pace for a while! Still sounds busy, but sometimes life just happens. We are still cooking a lot as well. After all I still have three boys to feed! I just don’t get things photographed for the blog or find time to post. Trust me, we are still eating, especially lots of veggies from the garden. Indeed life does go on! We are enjoying our holiday weekend, especially all the fresh summer fruit! We’ll be able to enjoy it later too since I just canned cantaloupe jam, blackberry jam, blueberry jam and froze cherry tomato sauce. A technician from Finland who worked in the lab at Stanford back in 1987 used to say, with her cigarette hanging from the corner of her mouth: You can sleep in your grave! it was her favorite saying, I’ve always wondered it it was a line from Finland, but her motto was that we should always be at full speed in life. We are pretty busy this Summer, but that’s the way our life has been for more than a decade, the important is that we have a ton of fun with our work, even with the challenges that we face all the time. Students, grants, papers, it can be stressful. blogging takes my mind out of it and is a great way to relax. I love the look of you burritos! I think I’ll definitely have to give them a go soon! Your food all looks amazing! Celia? Slowing down? I’ve often wondered if you even sleep. Look at all that fabulous food though. Gosh I really wish that I lived next door to you. It does sound like you’re relaxing and enjoying … Pretty good feeling right? Stefanie, it sounds fabulous, have a wonderful weekend with your family! Oh Celia, I’ve just read that you’ve been selected as 21 in the list of TOP Australian food blogs. I’m so pleased for you. I couldn’t believe that this wonderful resource and companion to life could go unrecognised. ive had a busy first half of a year, its time for me to wind down before i burn out. your bread baking is such an inspiration to me! ta. I don’t know how you keep up the pace, love. You work so hard! Hope you’re enjoying the sunshine though! That is a special bottle of wine, not only it’s saved purpose, but especially those gathered to share it. :) Cooking is therapeutic for me too, something I can get lost in and let the world fade away for awhile. All these things pair well with a light novel with a guaranteed happy ending. Oh how I’d love to go half speeds, too. School holidays give this opportunity. But sometimes when you’re used to full speeds, your half speed is in fact other’s full speed, LOL! couldn’t agree more. I’m about to have two weeks at our holiday house at Killcare and I can’t wait! It’s just me for the first week so I don’t even have to think of anyone else! Here is hoping for a less hectic and stressful end to the year, Celia. I love that cooking is so therapeutic for you – it is usually an escape for me too. And having tea with friends is just the best! !